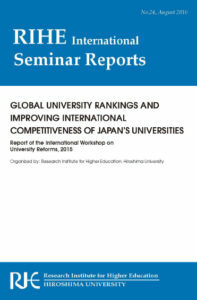 This is a summary reports series of international conference or seminar hosted by Research Institutes for Higher Education (RIHE), Hiroshima University in cooperation with various international organizations such as OECD, UNESCO, and consortia of universities overseas. This publication contains English articles on the topic of general significance by leading international scholars in the field of higher education. The entire text is available from issue No.6. This English publication series was published in order to enhance international research collaboration in the field of Higher Education. 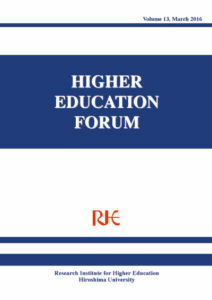 Ten volumes have been issued in total including “Expansion of higher education in Japan”, ”Short-term higher education”, “Higher Education Finance”, etc. 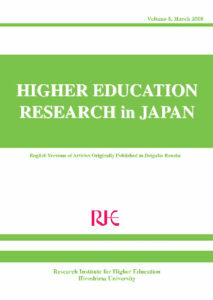 Issued as part of the “Center of Excellence in Research (COE) Program” which aims to facilitate international access to significant contributions by publishing English language versions of articles originally published in “Research in Higher Education (Daigaku Ronshu)” during 2003-2008. Copryright(c) RIHE Institute Library All Rights Reserved.